Return of the Lego Club! 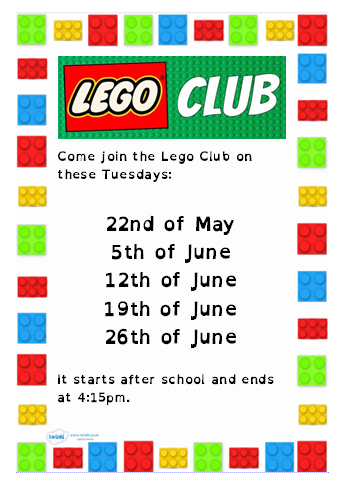 The Lego Club is back! Mr Keiller and Miss Millar are starting the Lego club again for P3 and P4 after school. Forms have already been handed out so if you’re interested then fill them in and return them to Mr Keiller. If you’ve lost your form, don’t worry there’s still time to ask Mr Keiller for another one. What have we done to annoy the snow makers? First our trip to Bannockburn was cancelled and now we can’t do our assembly today! We hope that you’re all staying safe and warm and having a fantastic time in the snow. When you come back, we’re going to be starting our next fortnightly block of literacy and we’re going to be reading and writing an imaginative story. The story that you are going to write is going to be set on a snowy day. Your job just now is to spend some time in the snow exploring it to see what it’s like so that you can think of some good adjectives and figurative language that you could incorporate into your snowy story when you come back. Your story can be about anything so you might want to start thinking about a plot and characters just now. Maybe you need to stay at home and watch some films for inspiration…. P4 had a fantastic time at their Christmas party this morning. They played Musical Statues, Pass the Parcel and French Christmas Corners. We all enjoyed dancing the Canadian Barn Dance, The Virginia Reel, The Dashing White Sergeant and The Flying Scotsman before singing some well known Christmas carols to finish. P3/4 and both P4 classes had a fantastic morning sharing their knowledge about the Romans during their assembly this morning. We hope you all enjoyed it and for those of you who were unable to come along we hope this gives you a flavour of what we have been learning about! Meeting the Roman Antonine Guard with P3/4, P4A and P4B! Our P3/4, 4A and P4B pupils had a fantastic afternoon meeting a Roman Antonine Guard and learning even more about how the Roman Army lived, trained and fought. Some of us got to handle his weaponry, armour and even experience battle re-enactment moves. We are all now very excited about sharing our knowledge at our yeargroup assembly in November. P2/3, P3 and P4 all enjoyed a short Scots poetry recital celebration yesterday afternoon as part of our school Scotland focus this month. Some of the P3 girls performed traditional Highland dancing which was outstanding. To finish we all enjoyed singing one of our favourites, ‘Three Craws’. Well done everyone, you were all very confident and effective contributors as well as being successful learners! A snapshot of P4’s Rainforest project and pictures presented at last week’s Assembly, showcasing our topic work.